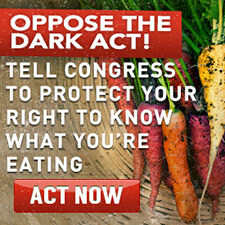 EWG > Agmag > Does the DARK Act Block Non-GMO Claims? Rep. Mike Pompeo (R-Kan.) doesn’t seem to understand his own anti-GMO labeling bill. During a hearing on a new version of H.R. 1599, Pompeo argued that his bill – which critics have called the DARK act, for Deny Americans the Right to Know -- to block state GMO labeling laws would still allow companies to continue to make voluntary claims that their products don’t contain GMO ingredients. There is nothing in this legislation that denies any food producer any ability to market their product as non-GMO as long as that is a truthful statement and accurate. In fact, section 102 of Pompeo’s bill would make any non-GMO claim a violation of federal labeling law – unless the non-GMO claim was approved through a new certification program to be established by the U.S. Department of Agriculture. Under Pompeo’s bill, it could take the USDA at least a year, and more likely years to set up such a certification program. After all, it took ten years to publish the rule implementing the National Organic Program. In the meantime, food companies would have no way inform consumers that their products didn’t contain GMO ingredients. Under current law, these companies rely upon guidance from the federal Food and Drug Adminstration to make non-GMO claims. More than 30,000 products have been certified as GMO-free by private organizations such as the non-GMO project. Perhaps Pompeo read his own bill in the dark. Taken together, it’s clear that the real intent of the new version of the DARK Act is to end all claims related to genetically modified ingredients – including both mandatory GMO labeling and voluntary non-GMO claims. Why? 9 of 10 consumers routinely tell pollsters they want to know what’s in their food and how their food is grown – the same as consumers in 64 other countries where GMO labeling is already required. Ironically, Pompeo’s bill is so poorly conceived that many of the food companies fighting mandatory GMO labeling would be subject to penalties if the new bill were enacted. Consumers simply want to know more, not less, about their food, including what’s in it and how it was grown.